I have never been to London. In fact, I’ve never been to the British Isles. While I have not travelled internationally extensively, I have been to Europe twice and missed it both times. 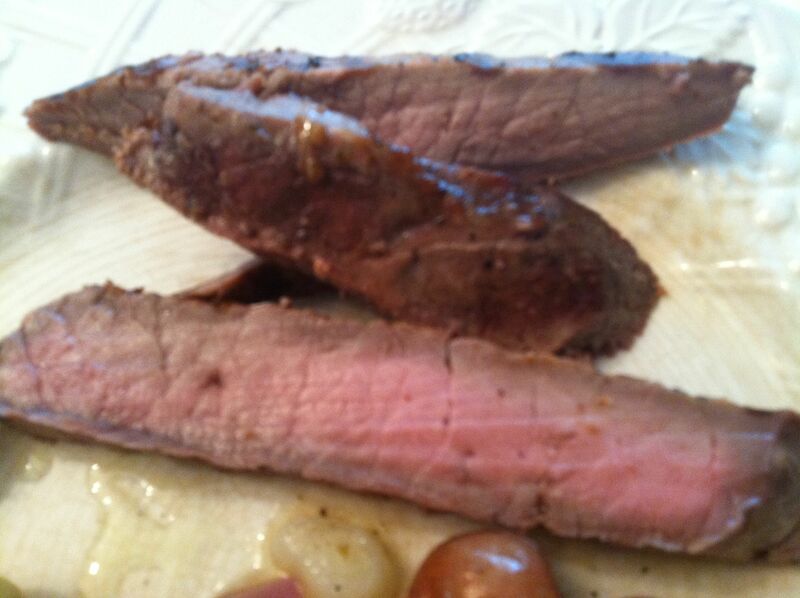 If any loyal (and rich) reader from the UK wants to fly me over to cook for a week…..
London Broil is such an easy dish. Marinate and grill. Wait and remove. Wait and slice. What I didn’t know is that London Broil is a dish really only known in the Western Hemisphere and not in London at all. 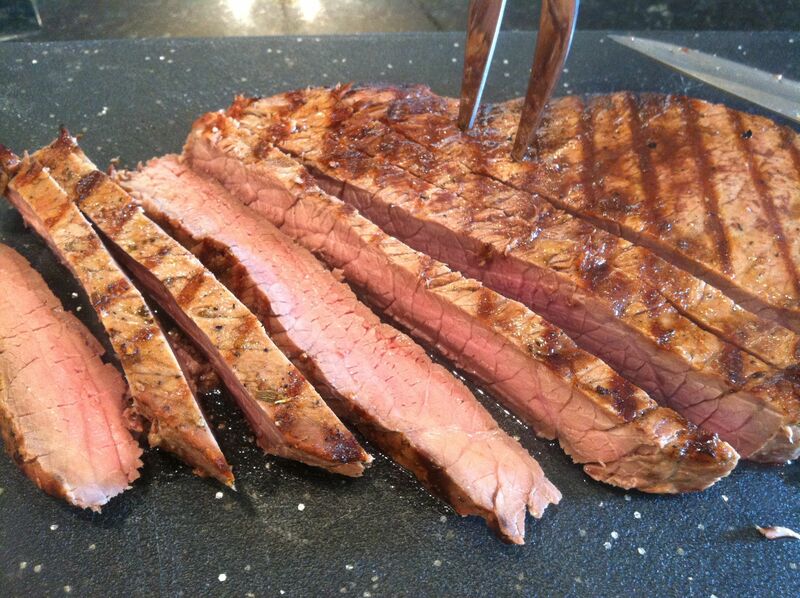 London Broil is not, contrary to popular opinion, not a cut of beef, but a style of cooking a cut. 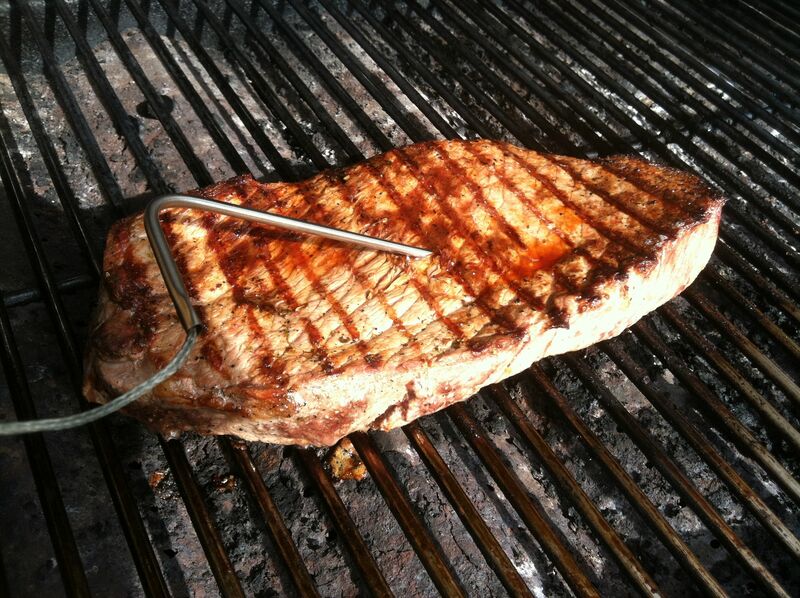 The cut of choice for London Broil in the United States is flank steak. You’ll love this. I love this cut of meat. It grills easily and flavors well. Really a very basic recipe. Once again, let it rest for 10 minutes before you cut into it. You won’t be sorry. 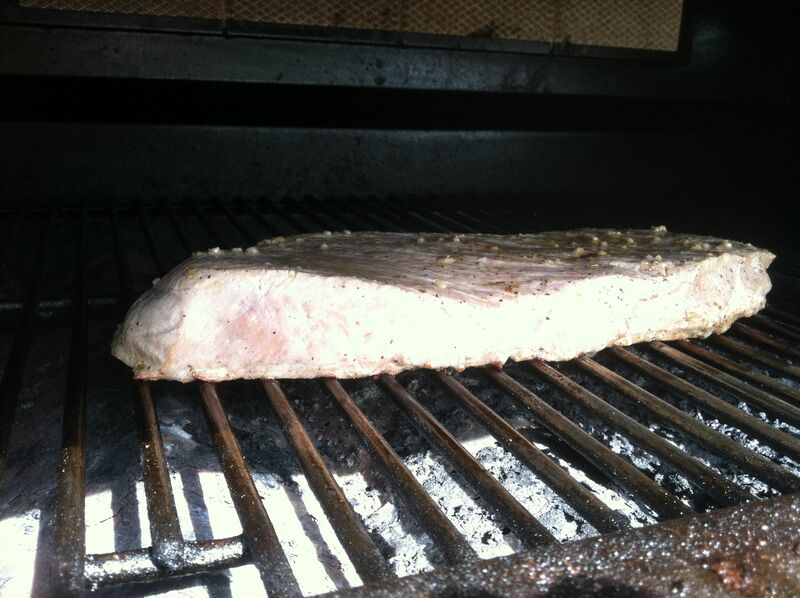 1) Prepare charcoal fire or preheat gas grill for direct grilling over medium heat. In large zip tight plastic bag, mix vinegar, oil, garlic, oregano, salt, and pepper. Add steak, turning to coat. Seal bag, pressing out excess air. 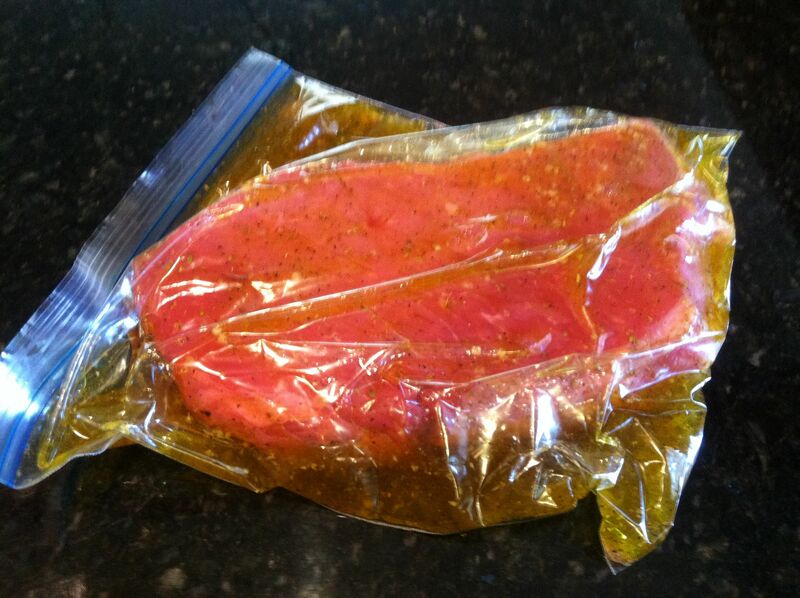 Place bag on plate and marinate 15 minutes at room temperature. 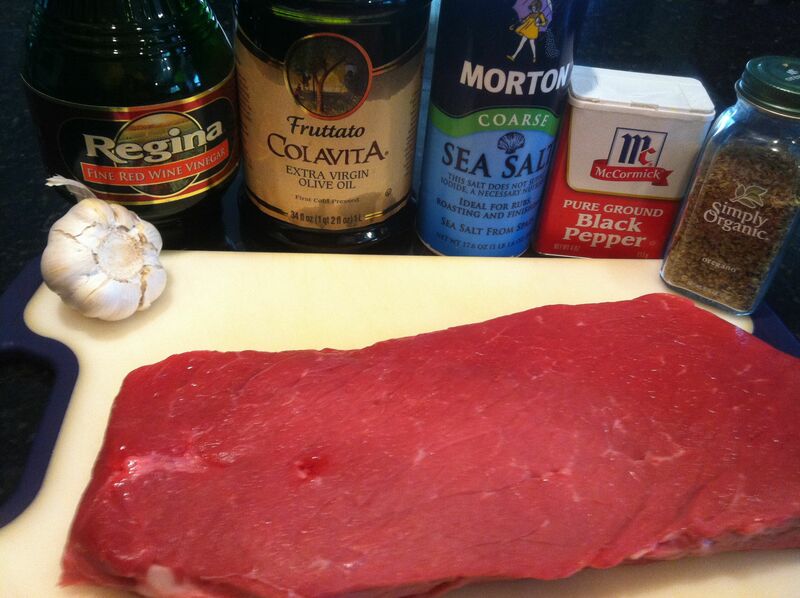 2) Remove steak from marinade; discard marinade. Place steak on hot grill rack. Grill 7-8 minutes per side for medium rare or until of desired doneness. 3) Transfer steak to platter. Let stand 10 minutes to set juices for easier slicing. To serve, thinly slice steak across the grain. Hah, in the fifteen years I lived in London, I must admit, I’d never come across London Broil. I guess you really do learn something new every day! Ahhh thanks! Thought I was being a bit dim there! Although I no longer eat a lot of red meat, this was a favorite of my (American) parents, especially when eating out! London broil is one of my go to dishes for summer company. I marinate in whatever appropriate ingredients I have. At the same time I slice up some red, orange and yellow pepper and marinate them in salad dressing (Newman’s Tuscan Garlic) and grill them in a grill pan (with holes). I serve it on a big cobalt blue platter along with a good boxed ( for ease) rice pilaf dish. It’s invariably a hit both for the eyes and taste buds. To really go over the edge, marinate some shrimp skewers in the same dressing and grill them up. I’m not surprised there’s no London Broil in London. Unless there’s been an unheard of culinary revolution in the UK, “English” food has got to eb the worst I’ve ever had. We ate mostly “ethnic” food when we were there, especially Indian and mid-Eastern. That stiff upper lip the English are know for arose because they need it for their food! LOL! Broil is a word that isn’t used over here at all actually! When we say grill, we mean broil, so we *grill* cheese on toast, not broil it! Great use of the less traditional steak cuts this really needs to be championed more often, as said not traditional London but a nice bit of Coleman’s mustard can help that. Mr RC we would love to have you over to cook with us then you can help educate others to the delights of the London Food Scene a real British Food! For a long time, I rarely ate red meat because I was concerned that it was higher in cholesterol than poultry, game and fish. However, with rising levels of obesity in the West and my suspicions that eating too many carbs could be a root cause, I have reintroduced some lean red meat back into my diet in the form of lamb and beef. I do like this simple and yet tasty recipe, perfect for busy people with little time to cook. I will follow this recipe but add some dried chilli flakes to the marinade and serve with plenty of roasted vegetables or steamed spinach or maybe both!. I love London Broil and flank steak. Done right, it’s hard to beat. Hey, thanks for the like! I’m a couple hours south of London but have to agree I’ve not heard of this one, sounds awesome tho. I don’t eat meat so I won’t try it but you’ll be spoilt for choice when it comes to food when you do make it to London one day.